Oldfields Riding has been a vibrant part of the community for over 150 years. 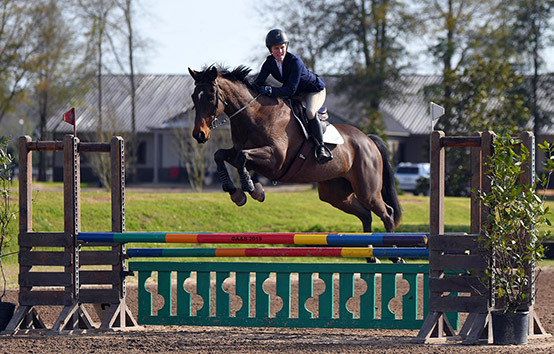 Students have the chance to compete in numerous horse shows, events, and Interscholastic Equitation competitions. Additionally, Oldfields is located in the heart of Maryland Hunt country. This gives students the opportunity to foxhunt on the weekends with three local packs. We also host several clinics throughout the year. Past clinicians include Bernie Traurig, Greg Best, and Joe Fargis. Our motto, “Where learning moves outside of the classroom and into the barn,” is part of our daily life. The girls have the opportunity to learn about horse care and management through working side by side with our hands-on staff, veterinarian, and farrier. Schedule a tour today to learn more about Oldfields Riding!